We’ve visited a lot of hotels in Cambodia and even in this genuinely friendly country we’d be hard pressed to think of one where we got a more delightful welcome than here. 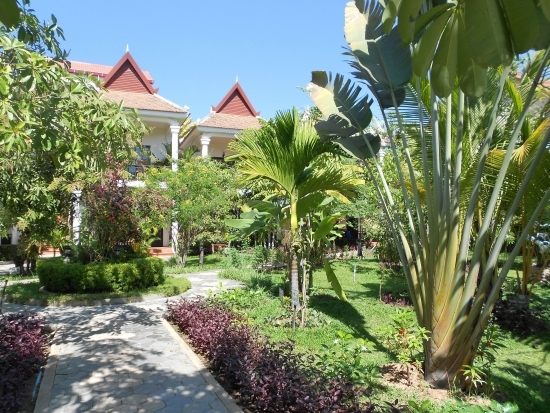 The Sonalong is a relaxing and family-friendly cluster of spacious, traditionally-styled two-storey villas, nestled in a tropical garden around a great salt water pool, all within walking distance of Siem Reap’s centre. Ad Book now! Rates from US$36++. Average rating 8.5 from 404 reviews. Located in Wat Bo village on a quiet road (of which there are not many in Siem Reap) the Sonalong is owned and managed by a garrulous and amiable Khmer who proudly explains in excellent English how he used to work with the UN. His parents-in-law talked him out of that job (he was involved in demining) as they no doubt wanted him around to help raise their grandchildren, and so he found his metier in hospitality. Meandering paths lead through lush tropical gardens. With rooms from less than $50 a night that clearly won’t include a personal butler and chocolates on your pillow at turn-down, but it does translate into a host of little touches that make The Sonalong an extremely popular hotel in this price range and one you are advised to book well in advance. There aren’t many better places to chill out after a day of templing. The clean and spacious en suite rooms are arranged one-up and one-down in two storey whitewashed villas with steep pitched tiled roofs. Upstairs rooms have a better view, but the external stairs are steep, so are not really suitable for anyone with walking difficulties. Each room has firm twin or king-sized beds, wicker armchairs, a wardrobe, a safe, desk and chair and 80+ channel cable TV. The balconies are much roomier than many we’ve seen and a really pleasant spot for catching the the last of the evening’s rays over a quiet G&T. As well as a minibar with cold beers, soft drinks and snacks there is also a small kettle and daily supply of complementary tea, coffee and mineral water. Breakfast – ranging from eggs any style to Khmer noodle soup — is included in your room rate. The in-room safes are much bigger than we saw at other properties. If you’re travelling with camera gear, this could be a major bonus. All rooms, which now include two family suites consisting of two large interconnecting bedrooms, two shower rooms and two separate toilets, are air-conditioned and there are ceiling fans both in the room and on the balcony or terrace to keep you cool – and the mosquitoes at bay — as you sip an evening sun-downer. The hotel gardens are home to another real bonus in this price range — a generator. This means you don’t have to melt or go without TV or internet should the power ever fail, which it does from time to time in Cambodia, particularly in the hottest season from March to May. It’s worth noting that the family suites are the only rooms not to have a view of the gardens. 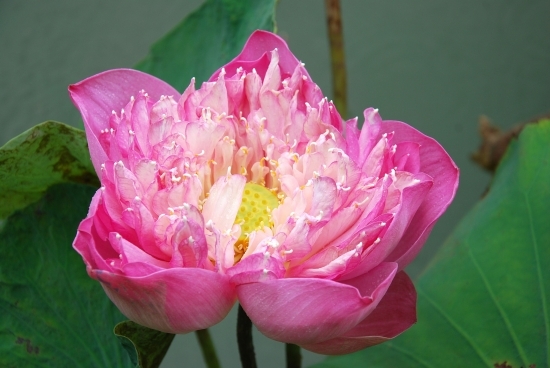 The gardens are home to a handy generator and some spectacular lotus blossoms. The swimming pool at the Sonalong is big enough to swim laps and is surrounded by a terrace with areas of sun and shade, cabanas and sun-loungers for tanning or just relaxing. A rather decadent poolside bar has been added to make dragging yourself away from this idyllic spot even harder. The gardens surrounding the pool are a dream for amateur botanists and keen gardeners, filled with individually-labelled trees and vibrant flowers which are home to chattering birds and delicate butterflies, as well as the odd lizard or tree frog. 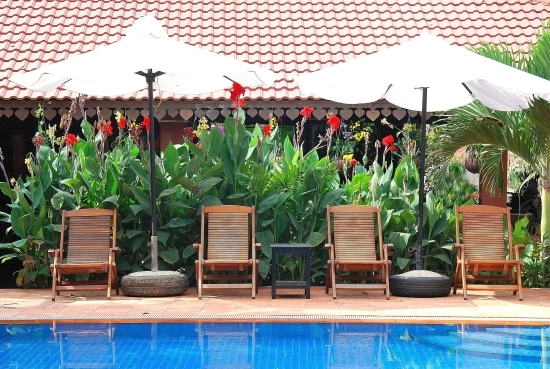 If lounging around watching the wildlife doesn’t take your fancy you can book a traditional Khmer massage, to be taken poolside, or in the privacy of your own room. They were in the middle of building a small spa when we visited, as well as a mini pool for the kids too. 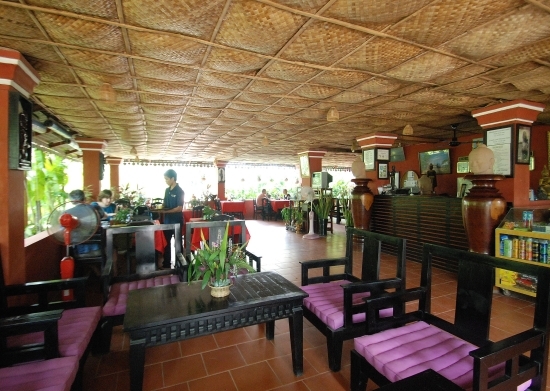 Nice spot for a beer, a snack, or maybe a Khmer massage. Adjoining the pool is a pretty lotus pond and the covered restaurant which is open from breakfast time until around 21:00 serving a selection of freshly and expertly made traditional Khmer stir-fries, soups, rice and noodle dishes from $3.50 up, and Western staples such as sandwiches, burgers and fries. You might find similar food around the Old Market for less, but of course you have to add the cost of transport into town and you won’t have the same relaxing ambiance in Pub Street. If you prefer to go into town it’s about a 15-minute walk, or the hotel has a handful of regular tuk tuk drivers on hand. A good selection of bars and restaurants can be found on nearby Wat Bo Road, but if you do plan to walk there at night and save the tuk tuk fare, a flashlight is strongly recommended. The breezy reception and restaurant. Sonalong’s drivers are also available for temple tours, trips to the Tonle Sap Lake, and of course transfers to and from the airport or ferry dock which are also included in the room rate. The drivers are careful, knowledgeable and speak good English, and if you want to take a tour with a bit more luxury or even a bit further afield, this can also be arranged. The Sonalong attracts a broad range of clientele from young families to retirees, but whoever you are, if you are looking for a peaceful tropical hideaway not too far from town with all you could need at your fingertips or a mere phone call away, then the Sonalong could be just what you are looking for. The room rates below are variable depending upon occupancy. Recommended. 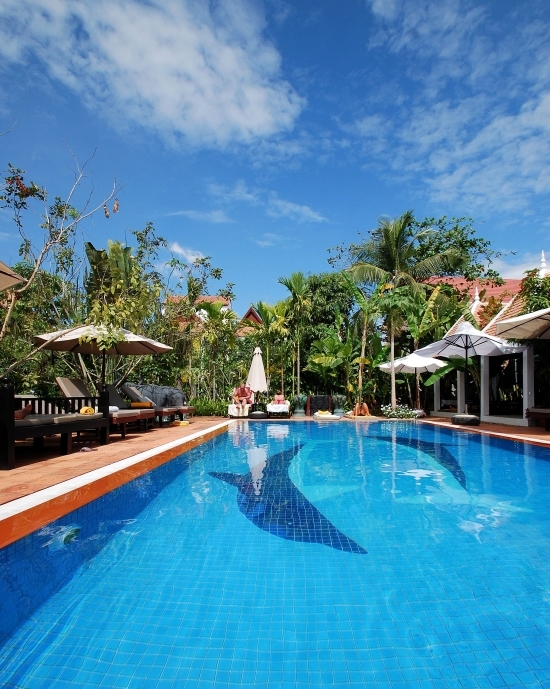 Check rates at Sonalong Boutique Village and Resort on Booking.com. Includes breakfast and pick up. 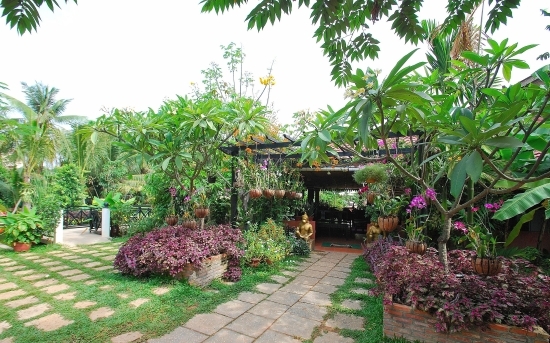 Room: Standard double room, low season: US$50, high season US$50. Notes: Includes breakfast and pick up. Room: Family room, low season: US$88, high season US$88. Notes: Includes breakfast and pick up.